was used to build all racers shown on this page. 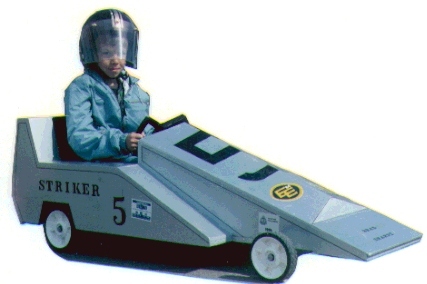 DERBY*GOKIT® provides plans, dimensions and templates for a "BASIC" racer. 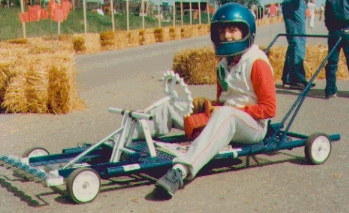 The racer shown here was built according to the instructions included in DERBY*GOKIT®. 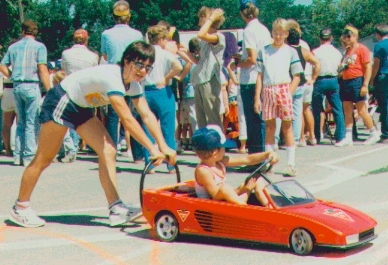 Because the red racer at the left is constructed exactly as described in the plans included in the kit, it is referred to as a "BASIC" racer. The final racer constructed would depend on the materials, tools and skills of the builder. The racers shown below illustrate the flexibility DERBY*GOKIT®allows to promote creativity of the participant. ABSOLUTELY NO BODY PARTS ARE SUPPLIED IN THE KITPLANS AND TEMPLATES ARE INCLUDED FOR THE "BASIC" RACER ONLY AS SHOWN ABOVE. 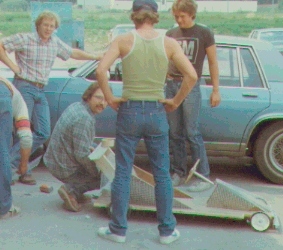 A HALF SHEET OF PLYWOOD MUST BE PURCHASED SEPARATELY TO BUILD THE "BASIC" RACER. THE MODELS SHOWN BELOW ARE INCLUDED ONLY TO ILLUSTRATE HOW VERSATILE DERBY*GOKIT STEERING COMPONENTS ARE BECAUSE WHEN OTHER PEOPLE DESIGNED THEIR OWN BODIES, DERBY*GOKIT STEERING COMPONENTS (INCLUDED IN THE KIT) ADAPTED TO THE VARIOUS LENGTHS, WIDTHS AND HEIGHT OF THE VARIETY OF DESIGNS SHOWN BELOW. 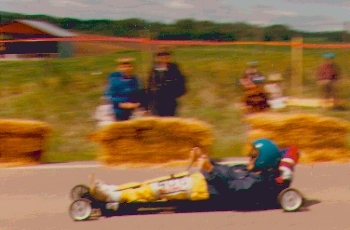 In the racer to the right, the "BASIC" design was modified by filling in the sides and the cowling. appearance of this "Mod" racer. having to form curved surfaces. difficult to shape in wood. The low Sport model does not resemble the "BASIC" design. DERBY*GOKIT®allows individuality of design. Note the flexibility of DERBY*GOKIT®. 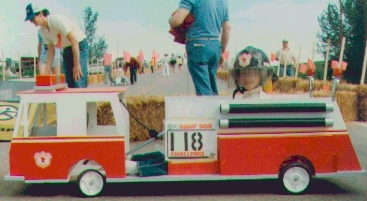 "Specialty" designs, such as police cars, fire engines and ambulances. 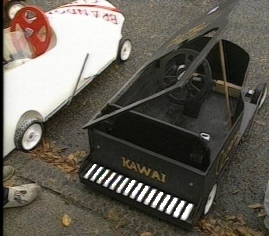 DERBY*GOKIT®can accommodate the longer wheel base of the fire engine or the extra width of the grand piano. Some people have access to different materials and skills than others. 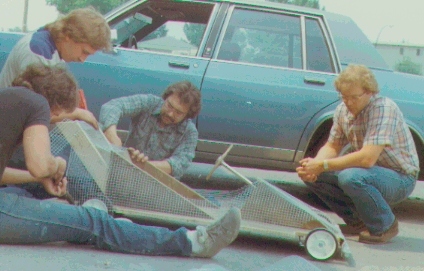 The chassis of the "Rail" shown here was constructed from metal tubing. Note that the "Rail" is even driven differently. amount of time, skill and work that can go into a racer. 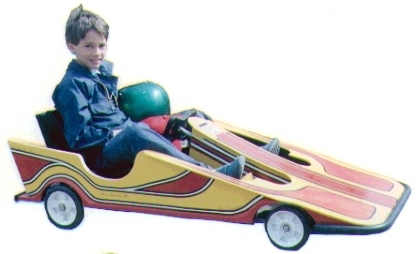 If you look closely, you can see the "BASIC"
racer design of the wooden portion. provide a base to hold the fibre glass. The fibre glass has been molded over the wire screen and an entirely new body design has taken shape.